As if the wet ground, mossy trees and flying insects not enough to make me apprehensive, our first stop was a giant tree that Vics called a ‘strangler tree or a killer tree’. His dramatic enunciation of 'a killer tree' gave me a heightened feeling of apprehension. 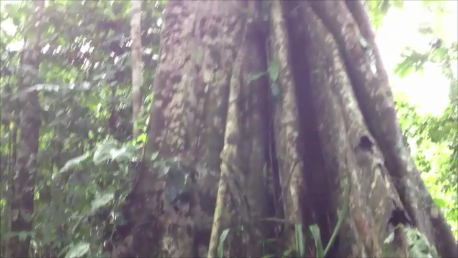 We lingered around the giant tree while Vics talked about the Rainforest. Vics explained, "The killer tree does not kill people. It belongs to the ‘strangler plant’, mostly from the fig family. They start growing as an epiphyte - a plant that grows on another plant but is not parasitic, such as the numerous ferns, bromeliads, air plants. They're nourished by air and rain. As roots developed to reach the ground, they surround the host tree eventually suffocating it to its death." We marched on wet grounds like an army, following Vics as our leader, who from time to time would stop to explain the type of plant we were seeing, and careful not to step on mounds of ants and insects. We hiked past pendula, gigantic wasp nests, glistening moist plants, tumbling vines and densely packed trees. Vics explained, “The warm humid air is responsible for the densely packed trees. They also prevent the rain from reaching the ground immediately." We saw a great variety of plants: strangler plants, epiphytes, emergent trees like kapok and cedar, cecropia trees, rubber trees and vines and medicinal plants. Not long after, Vics pointed to the ironwood tree. He explained that it’s aptly named because of its durability. The wood lasts for years, therefore, very valuable. In fact, the Turmalina was made of ironwood. It's now a protected plant in order to discourage people from cutting down the iron wood tree for its commercial value. People could only use the wood from the trees that had uprooted. As if by design, the trail we were walking on narrowed. It was lined by round steppingstones in the middle. The steppingstones looked as if they were made of concrete, but they were actually ironwood. Vics warned us to not wander off as it was easy to get lost in the forest and not be found. To demonstrate the vastness of the rainforest and the dangers lurking behind it, Vics told us a story about the resort owner's nephew who wandered off and got lost only to be found a few days later, his body submerged in mud. Thank God he was found alive. I lost track of time and beginning to get tired when I saw people coming from the opposite end of the trail. I thought we were close to the end of the trail, but Vic said, “we are getting there…about half a kilometer." It was more than one half kilometer in my calculation before we saw a brighter daylight. Before emerging from the densely packed forest and the canopy of trees, Vics showed us several medicinal plants like the the curare and annatto (lipstick tree). Curare contains alkaloids which help in muscle relaxation. The alkaloids are also used as an arrow poison. Vics mentioned that a variety of medicinal plants used as anesthesia, and to treat kidney and heart diseases or are used for making things like insect repellent could be found there. A few minutes later, Vics held up his hand, signaling us to stop and motioned for silence. And with one fell swoop, he had scooped up a poisonous frog from the jungle floor. He held it in his hand to show us its distinct features. As we approached the campground, Vics pointed to the Copa tree, wherein he pulled some hardened sap. He said, “This is a natural fuel.” He lighted it to demonstrate that was all they needed to start a fire in the campground. We crossed seven suspension bridges, which allowed us to explore more of the forest, to see more tumbling vines, aerial plants, and the tops of cecropia, birch, palm trees and deep greens. Those years of practicing yoga were put to use while I tried to maintain my balance and admired the rich deep greens below me. My concentration only interrupted by the appearance of vultures and hawks, eagles and toucans. I stopped at the middle of the seventh bridge when I saw a flock of black hawks flew overhead. The hike was somewhat strenuous that I passed on the next excursion - a visit to a shaman or medicine man. Superb writing once again. You've captured every detail of our excursion. HI, i was wondering if I could show my science class this webpage? we are doing a study on the Amazon.